Afghanistan's President Ashraf Ghani attends a two-day conference on Afghanistan at the United Nations in Geneva, Nov. 27, 2018. Ministers and senior officials from around the world are attending a conference aimed at affirming international solidarity for Afghanistan's efforts to promote development and stability. Two years ago, the international community pledged more than $15 billion as part of a four-year development plan for Afghanistan. The Geneva meeting is seen as a good opportunity before the next pledging conference in 2020 to gauge progress made on the country’s reform agenda. Afghanistan's Chief Executive (L) Abdullah Abdullah and United Nations High Commissioner for Refugees Filippo Grandi attend a two-day conference on Afghanistan at the United Nations in Geneva, Nov. 27, 2018. Toby Lanzer, the deputy special representative for the U.N. Assistance Mission in Afghanistan, says the conference will look at how well Afghanistan is following through on its commitment to battle corruption and make public financial management more sound. “And, that people who have been engaged in corruption are brought to brook, prosecuted, arrested, and put in jail if found guilty…It is the primary purpose of why we are here. And, yes, I think quite naturally, the question of peace, the question of ongoing conflict,” he said. 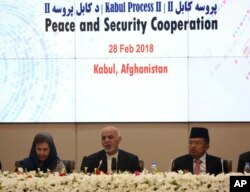 FILE - In this Wednesday, Feb. 28, 2018 file photo, Afghanistan's President Ashraf Ghani, center, speaks during the 2nd Kabul Process conference at the Presidential Palace in Kabul. Lanzer notes a seminal moment occurred at the end of February when Afghan President Ashraf Ghani said he was ready for talks with the Taliban without preconditions. Afghan forces have been battling a Taliban insurgency which considers the government illegitimate. While new opportunities for peace have arisen, Lanzer tells VOA they will not be explored at this Geneva session. “It is a conference about development first and foremost. But, we have carved out some space… Senior officials will not just be in the building attending the conference. OK. They are going to be in the sidelines. They will be discussing matters and I think that peace, stability, trade will be very high on their agenda,” he said. Next year will mark the 40th anniversary of war and conflict in Afghanistan. After four decades of instability, Lanzer says most of the country has a tremendous hunger for peace. He says the international community can lend support and guidance in moves toward peace, security, trade and development. 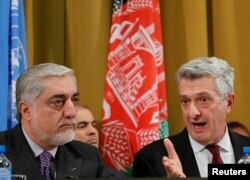 But, for them to be sustainable, he notes these processes must be Afghan-owned and Afghan-led.